Kat's Stitching: Grow Your Blog Party! It's time for a blog party! Since I'm hoping to get a lot of new visitors today, I should post a little about myself. My name is Kat, I'm 26 years old, and I love to cross stitch. My mother taught me how to stitch as soon as I was old enough to hold a needle, but I fell out of it for a while. As an adult, I started to have some anxiety issues and picked up some stitching as a way to relieve stress. I fell in love with it again and have been going strong ever since. I started this blog mainly to show off my WIPs and to connect with other stitchers. When I'm not stitching I like to read and watch movies so you may see mention of those things from time to time. Currently, I live with my wonderful boyfriend in Sheffield, Ontario. We just moved here from the other side of the country (and Canada is a large country). This is the other member of our family. 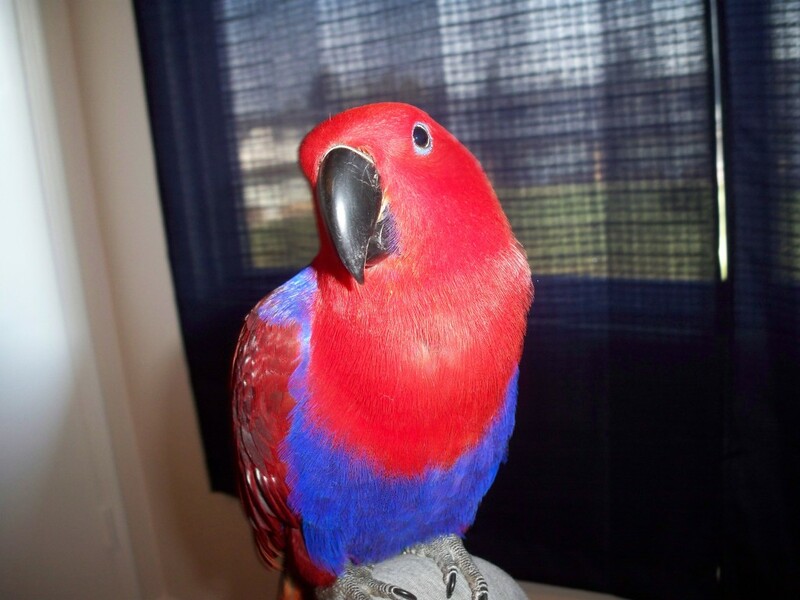 Nisha is a 5-year-old Solomon Island Eclectus. She likes to sit and talk to me while I'm stitching (she says things like "Peekaboo" and "Hello baby"), but if I don't pay enough attention to her she will sneak over to steal a bobbin of my floss and fly away with it. To welcome any new readers I may get, I'd like to offer a surprize giveaway on this post. The prize will be cross-stitch related. Absolutely anyone can enter. Just mention in a comment on this post that you would like to participate. On February 1st I'll randomly select one of the commenters to receive the prize. Please make sure that your email address is attached to your comments, otherwise I won't be able to contact you about it. I hope you enjoyed learning a little bit about me and I look forward to meeting many new people and finding some exciting new blogs to follow this weekend. Thanks for stopping by! Hi, I also re-started stitching due to depression and anxiety and it increased when I moved from England to Poland, so I understand how you feel. I find stitching helps me a lot. Would love to enter your give-away. I look forward to reading your blog. Hi I enjoy reading your blog :). Please include me in the surprise giveaway lucyrmitchell@yahoo.com thanks! What a lovely blog! I love your parrot! Hi! Thank you for visiting me earlier. I love your bird. My aunt had one that would talk to you. He would ask things like, "What are you doing"? I could listen to him all day. Good luck with your blog. I would like to try my luck in your giveaway. There is a giveaway on my blog,too. It's so nice to meet you. I love that you turned to stitching to help with anxiety. What a natural and healthy way to relieve tension and bring in some calm. I have been a stitcher for many years, and while many of my projects are in other areas now, I still pull out those cross stitches I've got going from time to time. I'm following and look forward to getting to know you! Oh I love the Mario stitching! And I won an HAED last month. Can't afford the fabric yet but I'm excited to start an epic piece of stitching. Hi Kat...glad to read your post from the west side of our country! Hi from Manitoba Kat! So glad to have found you via Vicki's party. Your bird is absolutely beautiful! I can just imagine her stealing your floss; Ha! I would love to be entered into your giveaway, thank you! I am your newest Follower, so I shall be sure to return! Hello Kat - I am here from Vickie's 2 Bags Full. Love your nursery rhyme sampler. I want to do something similar since I going to be a grandma soon. Your bird is beautiful. How cute that he'll steal your floss when you don't pay enough attention to him. I lived in Canada for a couple of years (Alberta)and even graduated from high school there. I loved being in the wild, the snow, and beauty of it all. I still have friends from that era of my life. Hello Kat, thank you for leaving me a sweet comment at my blog. Nice to meet you. I see you just (re-)started your blog and love to be a new follower to cheer you on :) I usually don't have that patience to finish big projects like yours. Good job! I started one for my son's birth and haven't finished it yet, he'll be 6 next month... haha, so now you know what kind of cross stitcher I am :) But I do love to enter in your give away though. Wow! Canadian and a stitcher - I'm so thrilled. The party is getting better and better. You have a lovely blog. I'm a new follower and participant of 'Grow your Blog'. Have fun at the party! Found you on the GYB list- nice to meet you and looks like we are participating in some of the same SALs so hope to see you around. I would love to be entered in your giveaway. Hi Kat, I'm already a follower but it was nice reading about you. Your bird is adorable! So many stitchers post pics of their dogs and cats. Please enter me in your drawing! Nice to meet you Kat, and your family, including Nisha! I primarily make jewelry, but used to cross stitch a lot, it is calming. Would love to be part of your giveaway! Stop my my blog too! Hi, great to meet you. I'm visiting from GYB and would like to be part of your giveaway. I have a giveaway, so please stop by. Hi, Kat. Nice to meet you. Please enter me in your giveaway. I'm a fellow stitcher, too, and found your blog through the IHSW. 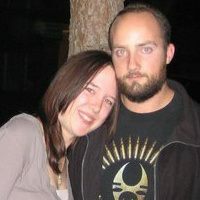 My blog is http://southpawstitcher.blogspot.com, where you can click to email me. Thanks for the opportunity! How delightful to find new (to me) cross-stitch blogs =D. I would like to participate into the draw and I'm now your follower. Hi. I just found your great blog thru the party. Your stitching is awesome. I will be spending more time going back thru your posts. I love your bird. I would love to be entered in your giveaway. Hi Ann! What a small world. Sheffield is just outside Cambridge. In fact, we do all our shopping there. I was living in Edmonton, Alberta before I move here. You have some great stitching work! I found your blog through IHSW. I like all your companions. Very colorful. And do come to visit my blog, since the party goes on. I have a nice vintage lace book to giveaway. See you there. I look forward to reading your blog ;) Thanks for the chance to win! Nice to meet you at the party! Hello Kat, I am happy to meet you! Your parrot has caught my heart! I have two yorkies, and if I don't pay enough attention, my little Emma begins to "talk" to me, or I should say complain! lol! She is funny! I love to do all kinds of crafty things, stitching is one of them, and I too love that it is very stress relieving. Yay! Happy to meet you! Too funny about your bird stealing your bobbins. My ferrets had liked stealing my crafting supplies. Good luck on your HAED progress. I like that Mario bookmark I may have to go snag the pattern. I love the company you keep while stitching, she looks very friendly. I'm not sure if I would be easily amused with my bobbins being carried away, I am a little OCD while stitching! I would love to be entered in your giveaway, thank you! Your bird is so beautiful, I just want to reach out and touch it. Visiting from the GYOB party...it's always so nice to meet a fellow stitcher! I would love to be entered in your giveaway and look forward to reading more of your blog. What a gorgeous featherbaby :) I have a Kiwi. I'm trying to get through the blog party list so slowly lol.. I'm over at http://leftoverchocolatestitches.blogspot.ca/ and I'll be blogging about my Kiwi soon :)...oh PS I LOVE to stitch! Found your blog through the GYOB party. I'm just getting around to visiting some of the other blogs now. I'm always glad to meet other stitchers and see what interests them. Love your bird, she's just gorgeous! Please include my in your giveaway. You can find my email in my blogger profile. Thanks!